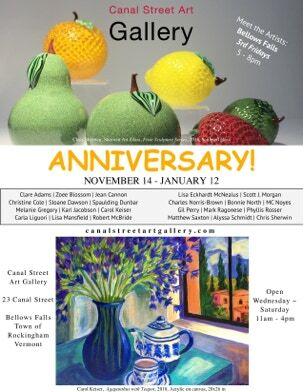 The public is invited to attend the opening reception of “ANNIVERSARY!” on Friday, November 16th from 5-8 pm. Take part in celebrating Canal Street Art Gallery’s first year achievements, friendships, and a collection of artwork from the areas’ most talented artists. 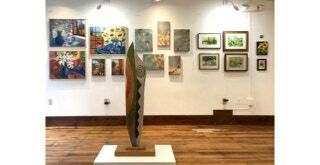 Including: Clare Adams, Zoee Blossom, Jean Cannon, Christine Cole, Sloane Dawson, Spaulding Dunbar, Melanie Gregory, Karl Jacobson, Carol Keiser, Carla Liguori, Lisa Mansfield, Robert McBride, Lisa Eckhardt McNealus, Scott J. Morgan, Charles Norris-Brown, Bonnie North, MC Noyes, Gil Perry, Mark Ragonese, Phyllis Rosser, Matthew Saxton, Alyssa Schmidt, and Chris Sherwin.